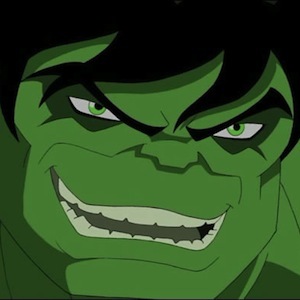 There’s a pretty fair amount of exposition at the start of this episode, with Bruce Banner on the run from the Hulkbusters and investigating the Cube before the confrontation between the Hulk and Absorbing Man, but then the action starts coming fast and furious. Time to transform: Note that when Absorbing Man knocks Banner around a bit, he knows full well Banner is the Hulk and actually waits for the transformation to take place, saying he’s been looking forward to fighting the Hulk. So it’s not like Absorbing Man takes advantage of Banner’s transformation to kick him while he’s down or take him out before he becomes the Hulk. Of course, nobody said Creel was all that smart, but still, it’s an important genre convention. Welcome to Vegas! The Hulk gets in three good hits with the Vegas sign but, when he misses, Absorbing Man regroups and hits back, twice, before they hit the desert floor. Again, a degree of having the “upper hand” in a fight. Creel loses his metallic form after impact. Stunned and unable to maintain it? He still manages to shift form twice (sand and then metal again) before the Hulk comes after him. With his hammer hands, Absorbing Man wails on the Hulk for a bit while also taunting him. Are the taunts what let the Hulk “break out” of being at a disadvantage? Does some game mechanic keep him holding back rather than hitting back here? The Hulk’s shockwave sends Absorbing Man flying up into the air, followed by a punch to send him into a mesa. One thing can certainly break up an attack sequence: when you knock an opponent out of your reach! Absorbing Man’s rock form is vulnerable to being shattered. “Hulk smash rock, Einstein,” the Hulk gloats. A use of an aspect or other game trait here? Or just cool roleplaying stuff going on? The Hulkbusters beat on the Hulk for a while with missiles and heavy ordinance. Hawkeye observes “From where I’m standing you look more beat-up than angry” so it seems like the Hulk has taken some damage from all of the attacks. As an aside, how badass is it that Hawkeye and the Black Widow, essentially two normal (albeit highly trained) SHIELD agents, go up against the freakin’ Hulk without even batting an eye? Black Widow nimbly dodges the Hulk while firing her widow’s bite. Hawkeye gets in a good four or five attacks before the Hulk manages to grab his flare arrow, which still explodes in his grip and blinds him, so that might not even count as a “successful” defense. Is the Widow engaging him in close combat a deliberate tactic to allow Hawkeye to make his ranged attacks uninterrupted? Smart, if so. The Hulk charges the incoming missile to protect Black Widow and Hawkeye – it knocks him for a loop but only stuns him. He’s still able to catch the plummeting SHIELD craft piloted by Bobbi Morse. A surprise attack from Black Widow (at least, we assume it’s her – it looks like her electrical “bite”) takes the Hulk down. Was his sacrifice to save Agent Morse what made him so vulnerable? Even the Hulk, an archetypal tough-guy, gets taken down by a hit from behind. Maybe he was nearly down already after such a pounding, but it’s still noteworthy. Wow, Black Widow is effective with that sneak attack thing: She takes Hawkeye out with it, too. Admittedly, ol’ Hawk isn’t as tough as the Hulk, but he also wasn’t beaten up first, either. Maybe the sneak attack is one of the Widow’s abilities (ala a rogue “backstab”) but it comes up elsewhere and is not just her doing it. Of course, she might just be better at it than most. With her double-agent subplot, is the Widow an effective player character, or is her apparent betrayal of Hawkeye one of his subplots/complications, played out with her as an NPC? Genre-enforcement: To what degree is enforcement of the “rules” of the genre the responsibility of the game system versus the gamemaster? For example, Absorbing Man not attacking during the Hulk’s transformation sequence. Should the rules encourage or even “enforce” the genre and, if so, to what degree? Sneak Attacks: Attacking from surprise or some other stronger position is a big deal. This first came up in Episode 2, and shows up at least twice here. It’s a pretty significant advantage, apparently. Normal Can Be Super: “Normal” characters like Hawkeye and Black Widow should be able to go up against “super” characters like the Hulk and even win (as they do here). There may be some super-settings where that’s not an option, but in a comic style one, it should be.